The 189MW Rim Rock wind farm is the single largest-capacity wind project in Montana. Image courtesy of NaturEner. NaturEner’s wind farm includes 126 Acciona AW77 1.5 MW wind turbines, generating 662GWh of electricity per year. Image courtesy of NaturEner US. The electrical system at Montana wind farm includes two substations, installed with 34.5kV and 230kV breakers. Image courtesy of NaturEner US. San Diego Gas & Electric will purchase the power generated at Rim Rock for a period of 25 years. Image courtesy of NaturEner US. Rim Rock Wind Farm is a 189MW renewable power project located in the US state of Montana. The $400m project is owned by NaturEner and is the single largest-capacity wind farm in Montana. The commercial operations at the wind farm began in December 2012. The wind farm will generate 662GWh of electricity per year, which will be sufficient to supply for 60,000 households and is expected to offset approximately 450,000t of greenhouse gas emissions per year. The development of the Rim Rock wind farm contributed approximately $40m to Montana’s economy. The Toole and Glacier counties of Montana will get $2.5m in property tax from the project. The Rim Rock wind farm extends over 21,000 acres, taken under landowner lease agreements. NaturEner will pay approximately $1.5m per year as royalty to the landowners. The wind farm consists of 126 Acciona AW77 1.5MW wind turbines, capable of generating 189MW. The AW77 turbine tower is 262ft tall and is attached with three 118ft long blades with a rotor diameter of 70m. The rotor has a swept area of 4,657m2 at a nominal rotation speed of 18.3rpm. The automatic system of the turbine is designed specifically for improving the alignment of the rotor with the wind direction. A stable interlocking system has been set up for achieving the optimal production position, attached with a powerful braking system. "A stable interlocking system has been set up for achieving the optimal production position." The 12,000V turbine generator reduces the requirement for step-up transformers. The towers are connected by approximately 50m of underground cables. Fibre-optic cables are connected for establishing communication networks. The electrical system consists of east and western substations equipped with 34.5kV and 230kV breakers. The electricity generated by the turbines is transmitted to the substations through the underground cables. The wind farm also includes nine power collection circuits and two generation tie-lines. The tie-lines connect the collector substations to the regional electric transmission grid. The wind farm also includes a 5,000ft2 operations and maintenance building. San Diego Gas & Electric will purchase the 662GWh of power generated by Rim Rock wind farm. The power sale is initiated under a power purchase agreement that is valid for 25 years. The power transmission to San Diego Gas & Electric will be made through the Montana Alberta Transmission Line (MATL). Hay Lake Switch Station acts as the connection point between the wind farm and MATL. Construction of the wind farm commenced in October 2011 and was completed in December 2012. The project created approximately 300 contractual and 20 full-time jobs during the construction phase. "The project created approximately 300 contractual and 20 full-time jobs during the construction phase." The major constructions involved 45m of access roads along with crane paths for transporting the turbines. Installation of 126 concrete turbine foundations along with electrical infrastructure and power transformers was also undertaken. Financing for the 189MW wind farm was provided by Morgan Stanley and San Diego Gas & Electric provided tax equity financing for the wind energy project. ACCIONA Windpower was awarded the contract to supply 126 turbines for the project. ACCIONA will also undertake the transport and installation of wind turbines along with the operation and maintenance for seven years. The contract for the design and construction of the wind farm was awarded to Mortenson. The works include the construction of access roads, turbine foundations, overhead and underground electrical collection system and substations. Construction of the generator tie line and operations and maintenance facility was also undertaken by Mortenson. Burns & McDonnell was awarded the contract to conduct the evaluation study for the Rim Rock wind farm. 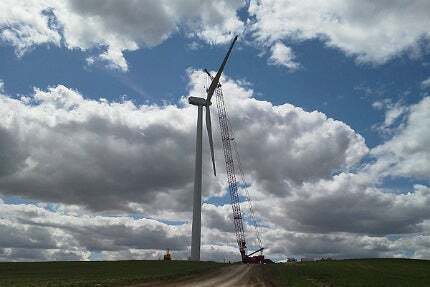 The study included an infrastructure requirement for the project, production estimates for the wind energy site, and the proposed interconnection to the Montana-Alberta tie-line project. RES America Developments has secured a contract from Xcel Energy to construct the 200MW Pleasant Valley wind farm in the US.